Digital Marketing apprentice for Families, Children and Learning. 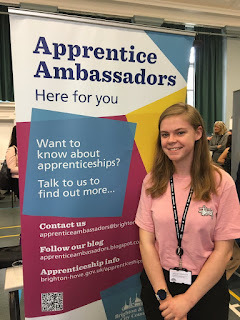 How did you get into the apprenticeship? My route to an apprenticeship was something of an unexpected one. 2017 brought around changes to the way apprenticeships were set up, allowing myself, a 35 year old with diplomas to sign up. Before working for Brighton & Hove City Council, I was an admin temp for 18 months, while bringing an end to five years as a self-employed graphic designer which I begun in 2012. Since coming into my role during October, I have now got used to new ways of working compared to my old job. I have flexibility in how I work and when I do in the week, similar to how it was when I was self-employed, just as long as I am meeting my targets. Working with the council I have a daily minimum of hours instead of having fixed start and finish times this help me to deal with travel challenges when they occur or support situations like unexpectedly having collecting my children from school. Things like this have helped me to feel that I can focus on my work with no nail biting, as long as I am on the same page with my peers at all times. Working at Brighton and Hove I have felt that my insights and opinions are genuinely sought after and required. My experience as a freelancer has supported me greatly with what I have been learning as a digital marketer. Communicating as a designer is more than familiar to me, but the planning of marketing strategies both large and small are another world entirely. Being an apprentice is about learning something new while being energised and enthusiastic for something that could further your career and build you a future. Customer service and admin was never my thing, but being a creative person and having an appreciation for various projects most definitely was. Having the opportunity to earn money whilst also gaining new skills and learning has been a huge blessing. Also to be able to work alongside supportive colleagues is excellent. I receive great support from the other apprentices and tutors at college too. Whether an apprenticeship would be something for you is definitely a decision only you can make. But with the wide range of job tittles now available anyone could consider committing to one. It is simply a matter of having the right opportunity arriving when you are looking for it. I was asked whilst working here not too long ago whether an apprenticeship is something I would want my children to do. To that the answer was yes. Because Not only are apprenticeships becoming popular increasingly accessible, they are widening the field when it comes to careers. You can fast-track your career choice by learning on the job as well off it. Apprenticeships are a way of allowing you to jump in at the deep end straight away and doing it with the right support behind you. Landing the right apprenticeship will have you excited for both the job and the training that comes with it. If an apprenticeship is something that might consider, here are some pointers which may be useful. Look for fully detailed job descriptions. Make sure that most of your questions have been answered here so you feel comfortable applying for a role. Research the employer after seeing the advertisement. This will help you form any questions you may have for the employer before making an application and if you get an interview. If you land an apprenticeship… ENJOY IT! I have recently completed my A levels at Varndean college I studied law, photography and public services. At the end of it I knew I didn’t want to go to University but I also didn’t want to jump straight into full time employment, I wanted to boost my education even further but still earn some money. I thought the best way to do this would be to join an apprenticeship. To begin with I didn’t realise digital marketing was an option as an apprenticeship. But after having researched the role I realised it was something I wanted to do. What’s been the most rewarding part of your apprenticeship so far? A few weeks into my apprenticeship I was asked to put together a news article that was then later published in The Argus. Seeing the printed version of my story and showing it to my friends and family was a real achievement for me. What are the key benefits of doing an apprenticeship? To start with you’re able to earn a wage whilst learning new skills; this in my opinion is a huge benefit. But you’re also able to kick start a career whilst being given the help and skills that you need. The difference with working in a job to working as an apprentice is that as an apprentice you’re starting a career that you can build upon and set up a future for yourself. Yes, I would recommend an apprenticeship to others, especially if they are unsure what to do next. Then at the end of it if it wasn’t for you there is still the option of going to University or taking your new skills into another job. I’m often asked do you wish you went straight into an apprenticeship after finishing school. My answer for that is no, because if I had I wouldn’t have gained the skills from previous experiences and I also wouldn’t have this exact opportunity that I do now.